Over the past 30 years, several changes have occurred in and around forests laws in the country. Most significant are the passage of keystone legislations recognising rights traditionally enjoyed by adivasi and forest-dwelling communities over forestland and resources (the Scheduled Tribes and other Traditional Forest Dwellers (Recognition of Forest Rights) Act, 2006), and those that have accorded – at least in principle – significant powers to village-level Gram Sabhas as a push towards participative democracy and relatively autonomous governance (the Provisions of Panchayats (Extension to Scheduled Areas) Act, 1996). At the international stage, fulfilment of State obligations has led to the passage of the Biological Diversity Act, 2002, that protects traditional knowledge systems, and indigenous biodiversity. These legislative milestones also highlight a more crucial shift. The very nature of the State’s obligations towards forests and forest governance has changed entirely. However, in recent years, there has been an increased effort from the State to re-imagine forests and their utility. Legislations such as the Compensatory Afforestation Fund Act, 2016 (CAFA) and the recently released Draft National Forest Policy, 2018 (NFP, 2018) are indicative of this trend. The NFP 2018, especially, reconstructs forests from being primarily a vital ecological entity to a sustainable industrial resource. The Draft Policy places forests against the metric of economic valuation – a market-oriented approach. This reduces the historically conditioned, organic symbiotic relationship between Adivasis and forest-dwelling communities into a reductionist linear framework. CAFA and its Draft Rules have come under intense scrutiny and critique from environmental activists, lawyers and civil society organisations. The central criticism remains that the CAMAPA and its rules also measure forests in economic terms since the net-present value mechanism is the basis for afforestation activities. The Act also has no provisions for appropriate community participation or engagement, and afforestation activities are designed to be carried out in a centralised, bureaucratic fashion. The afforested areas would also then serve as a forest resource base for industry. Forest lands over which rights of adivasis have been recognised or are pending recognition have been usurped for carrying out plantations under the CAFA. Plantations were being carried out rampantly by state forest departments, even prior to the passage of this act, which has now legitimied carrying out of plantations on forest land. While the criticisms for the NFP, 2018 and the CAFA differ slightly in form, the basis for both remain the same: both contribute to a systematic violation of the FRA and PESA. It is pertinent, in this light, to look at experiences in the interface between the FRA and the CAFA in order to develop not only a more holistic understanding of the two, but to see in stark contrast, the disentitlement of entire communities, as a progressive law is slowly diluted. The state of Gujarat has the third highest land utilised for afforestation. However, government data for plantations and afforestation is in stark contrast to the ground reality in the districts of Aravalli and Dang. 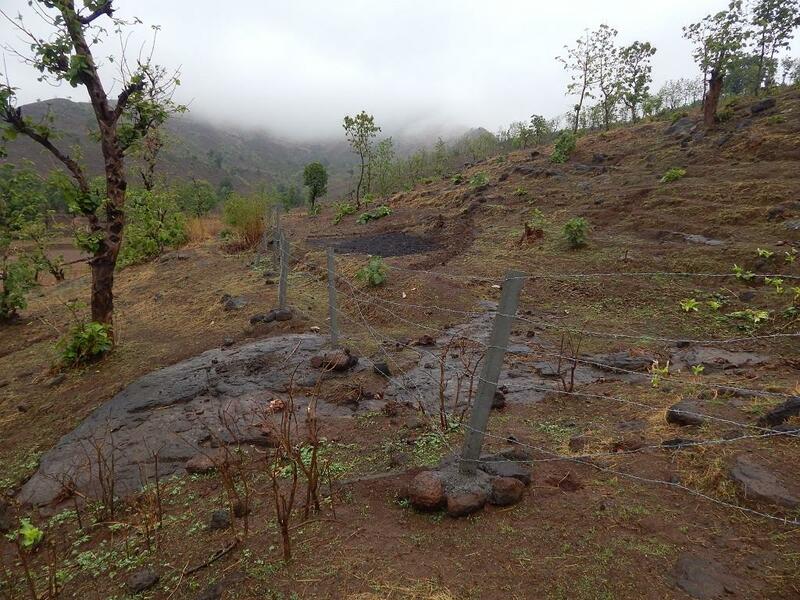 In the villages of Jamgadh, Kadvadi, Navagam, and Jharda, Meghraj block, Aravalli district (an erstwhile part of Sabarkantha district), the forest department has begun plantations under CAFA. Large-scale plantation of teak and eucalyptus has occurred and where once there existed scrubland, now there are dense forests of water-intensive species. Leaving aside the disastrous environmental impact of widespread eucalyptus cultivation in arid, hilly terrain, these plantations are raising far more ‘fundamental’ concerns. In several areas, the forest department has planted trees under the compensatory afforestation system on private land. The trees have been planted on land claimed under the FRA, land that is under the customary ownership of community members and is being actively farmed. This practice is in clear violation of Section 4(5) of the FRA and guidelines established thereunder, which debars the utilisation, transfer, acquisition, etc. of any land to which a claim under the Act is pending. There emerges a very clear modus operandi on part of the forest department to engage in this patently illegal act. In between cropping cycles, land is usually left fallow. At this stage, the farmer is approached by officials from the forest department. She is told that since her land is lying vacant, the department would like to grow a few saplings, which they would remove once she wanted to farm her land again. After a few months, when the farmer chooses to farm her land, she is told by the forest department that it is now illegal to fell these trees. The farmer is thus duped. The trees are only cleared when the forest department chops them down for sale, but even then the stumps are left in the ground, which effectively destroy soil fertility and suitability for agriculture. The farmer here receives no payment for the use of her land, nor any compensation for the damage done to it. In Neempada village, Ahwa block of Dang district, where adivasis comprise 95 per cent of the population, all the Individual Forest Rights (IFR) claims filed by 26 residents, remain pending with the District Level Committee (DLC) since 2016. Dang is classified as a Schedule V area in the Indian Constitution. Since the last week of April, the forest department illegally dug up forest lands of 10 of these claimants to carry out plantations while the claims were pendant. An application was submitted to the Collector on the March 30, 2018 requesting for appropriate action, but was never responded to, claim villagers. Despite the submission of such application, preparation for digging lands of remaining claimants continued to take place. Currently, the forest department is undertaking steps to build a fence around these dug up lands to prevent claimants from accessing them. The officials have also been resorting to violence and issuing threats to the claimants. “They beat guards threatened to beat us up if tried to get anywhere close to our lands,” Somabhai Barde, one of the claimants whose land has been dug up and illegally captured told us. This year, however, the forest department managed to dig up their lands. The aggrieved villagers approached the range officer but no steps were taken to restrain the illegal activity. An application was submitted to the Collector on the May 7, 2018 informing and requesting for appropriate action to be taken to which no response has been received till date. The department’s methods have now begun to resemble the colonial strategy of ‘divide and rule’. Recruiting from among the adivasi community also provides them exemption from being charged under the Scheduled Castes and Scheduled Tribes (Prevention of Atrocities) Act, 1989 in cases where violence is resorted to. The passage of the CAFA will only embolden the department in its quest to deprive adivasis of their forest rights. Taking a more macroscopic perspective, the poor state of FRA implementation across the country, especially in Gujarat, seems to operate in close synchrony with a growing impetus to plantations under the CAFA, 2016. Despite the judgement delivered by the Gujarat High Court in 2013 for re-examination of IFR claims, the approval rates stand at a paltry 44 per cent as of June 2016 (80,540 approved claims out of 1,82,869 claims filed). At the same time, plantation activity under the CAFA is operating at an accelerated pace. While minimal data on Gujarat is available on the environment ministry’s portal, a report conducted by the Indian School of Business notes that there is significant discrepancy in what is reported and what exists on the ground. “Notable exclusions included Gujarat, a state with vigorous plantation activity but only three plantations recorded on the portal,” it said. The purpose behind such gross underreporting is at present unclear, but it is beyond doubt that a strong relationship exists between the consistent denial of forest land tenure rights under the FRA and the hurried plantation of eucalyptus and teak under the CAFA. Plantations under the CAFA are not just in lieu of diversion of forest land elsewhere, but are designed to create a mass of commercially viable wood and forest products that can be leveraged by industry. The effort is thus to marginalise forest-dependent communities and commodify forests under the garb of ‘sustainable development’. The law is clear on this point. The FRA specifically debars the diversion of land on which claims are pending, and yet, the forest department has been involved in a brutal disentitlement drive under the CAFA. Regardless of other reasons provided by government authorities for the utter failure in implementation of the FRA, it remains equally plausible that the larger aim is to ensure that claims remain pending so that illegal exploitation by the forest department continues unhindered.